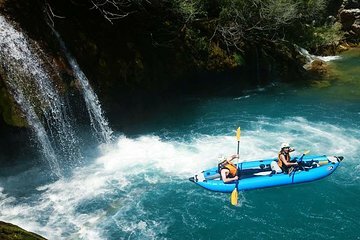 Enjoy an active way of discovering the beautiful Mreznica River and some of its loveliest surrounding scenery on this half-day kayaking tour. Make your way to the departure point in the village of Primislje, get familiar with your gear, and set off in the company of a guide; this tour is accessible for participants of various ages and skill levels. Paddle alongside steep canyon walls, see waterfalls and lush plant life, and enjoy the setting’s tranquility. All necessary equipment is included for your ease. We were in Europe for 3 weeks and this was certainly one of the highlights. Our guide was fantastic and looked after my 70 year old mother like she was the queen: We were a group of 7 ranging from the age of 17-75 and everyone had a blast: I highly recommend. Our family had a great day kayaking. The staff were funny and friendly. The scenery was beautiful. It is not a hard workout, but still very exciting. There are several nice falls we took the kayaks over. The kids loved jumping off of the cliffs and swimming at the stops along the way. Our best family kayak adventure yet! !